Toms River took a small step forward on figuring out how to replace an old first aid building it once hoped to turn into a community center and polling place in Ortley Beach. The old Ortley Beach First Aid Squad building reverted to township ownership after its volunteer membership dwindled. Discovering extensive building flaws and Americans with Disabilities Act non-compliance in its structure, the township planned to demolish it after first using it as a polling place one last time in November 2012. 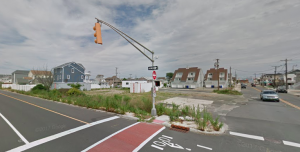 Before that happened, Superstorm Sandy hit, the building was destroyed, demolished in 2013, and now the township is deciding again what a possible building there would look like. The township council agreed late last year to go ahead with some of the soft costs toward replacing the building — that is, architectural plans and other engineering details for what to build on the now-empty lot at Sixth and Route 35 South. Township Engineer Rob Chankalian said estimating a cost or a timeline for such a project is still a long ways off. “At this point it is too early to determine specifics and what it might look like or cost,” he said last month, adding that going out to bid to prepare any plans also hasn’t taken place, just that the capital budget is now set aside to do so. At this point, the township must decide what the building would include and what it would look like. For example, the idea of having it operate a police substation or community service officers’ office, in addition to having it serve as a designated polling place, are all possible, he said. Suggestions have also included a community gathering space to hold meetings or social events, or to also have bays large enough to accommodate a firetruck. Some of those suggestions came out of the post-Sandy grant to create an Ortley Beach Strategic Plan as a result of community feedback, according to the report of the plan made by Maser Consulting then. One of the difficulties lies in constructing a building that is also compliant with flood design, Chankalian said. The previous plan, before Sandy, was to create a somewhat smaller building footprint to allow for more ADA-compliant parking for the 6th Avenue building. But designs to account for flood elevation might mean space is need for outside stairs to reach entrance ways, for example. The building was the longtime home of the Ortley Beach First Aid Squad, but due to dwindling membership the squad disassembled in 2012. OBFAS was founded in 1969.